In a nutshell, what are probiotics and how do they benefit your body? They battle the fungus, parasites and unhealthy bacteria that cling to your intestinal walls. They remove them and enable your digestive system to absorb all the vitamins and minerals into your body’s vital organs. In that phase they act as a cleansing agent. They support your immune system and act as a security force by destroying the foreign invaders of pathogenic bacteria. They supply energy to your digestive tract, which is the nerve center of your immune system. After anti-biotic therapy, your healthy flora (bacteria) diminishes. Probiotics replenish your balance of good flora. (For more details please read our report “Probiotics Defined”). Why is ProDermix® superior to other probiotics? ProDermix® formulas contain probiotics (FOS or inulin) which can increase the power of the formula up to 1000 times in some cases. The ProDermix® formulas are manufactured with very pure and exacting standards. Every batch is tested and retested through independent lab verification before the probiotics are put into the bottle. The strains are classified and categorized with a genetic ID system similar to human fingerprinting. ProDermix® formulas are assayed by independent labs to verify the potency and hypoallergenic status of the strains listed on the bottle. Lab testing revealed that ProDermix® capsules contain overage of 30 to 150 percent more potency than the label states. Prominent probiotics add overage to guarantee the stated amount in case of potency loss. Does ProDermix® help relieve other symptoms besides athletes foot fungus? It is truly amazing how many benefits our probiotics affect the GI tract and the human body in its entirety. New reports come in daily regarding the positive effects of ProDermix®. If that is true, why do you have a foot in your logo and advertise the defeat of athletes foot? Fungus of the outer skin, particularly athletes foot, is the result of fungus in your innards. Eliminating fungus in your GI system helps relieve the fungus of your outer skin. No other probiotic has yet claimed to relieve foot skin fungus. Now, ProDermix® has relieved the symptoms of athletes foot to hundreds of people. Same with Acne, Candida, Crohn’s, UTI and much more. If it can bring relief to the outer skin, imagine what a job it must be doing inside. 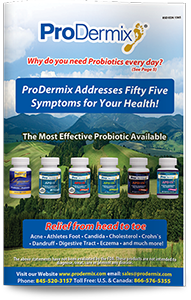 Our report “Probiotics Defined” lists over 55 benefits probiotics deliver to your body; ProDermix® delivers all these benefits. Are the symptoms relieved by probiotics as reported in your brochures documented by clinical studies? Yes. The Prodemix® Institute of Probiotics (the research arm of ProDermix®) has classified clinical studies conducted at major medical universities worldwide for most of the 55 symptoms addressed by Prodermix® formulas. Learn why you need Probiotics everyday. The above statements have not been evaluated by the Food and Drug Administration. These products are not intended to diagnose, treat, cure or prevent any disease.